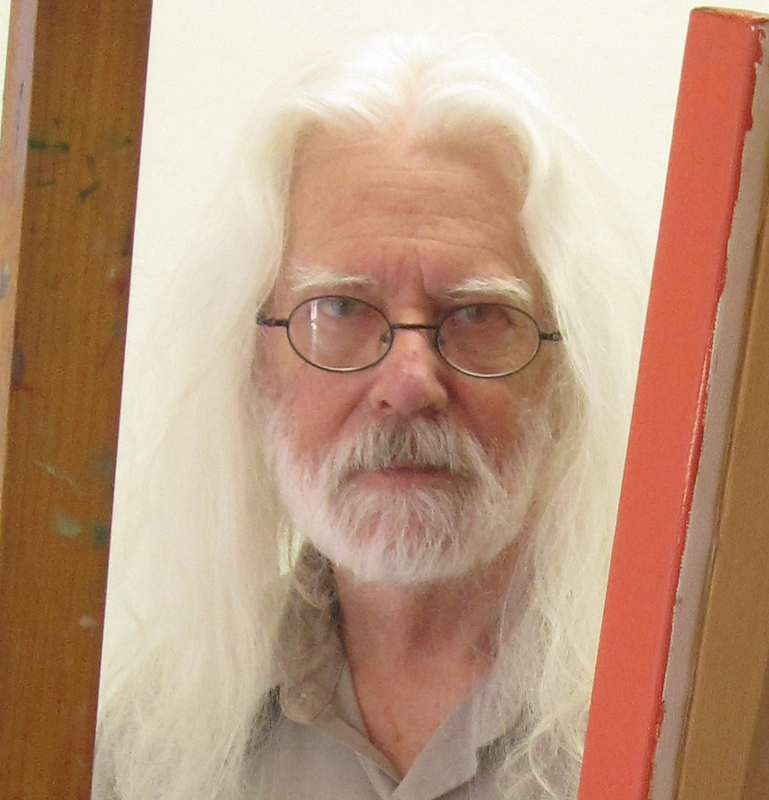 Meet Artwork Archive Artist Lawrence W. Lee. 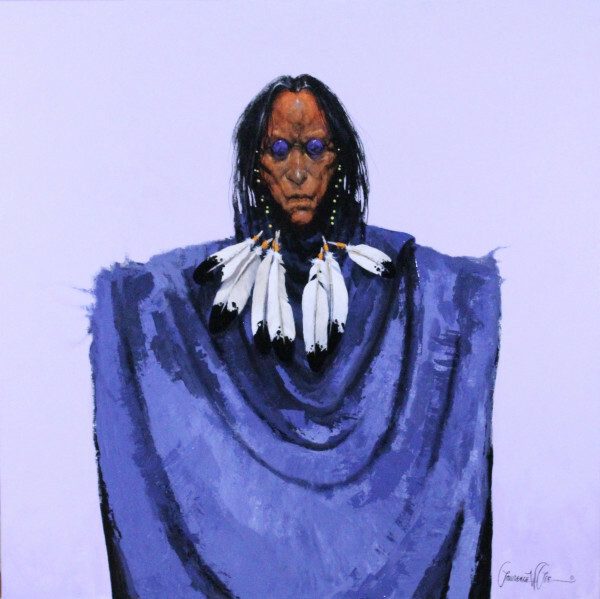 A true original most known for his distinctive shamanistic imagery, Lawrence paints for Southwestern art aficionados out of his studio in Arizona. His strong, instantly-recognizable brand is no accident. This savvy businessman understands his audience and caters to its tastes. 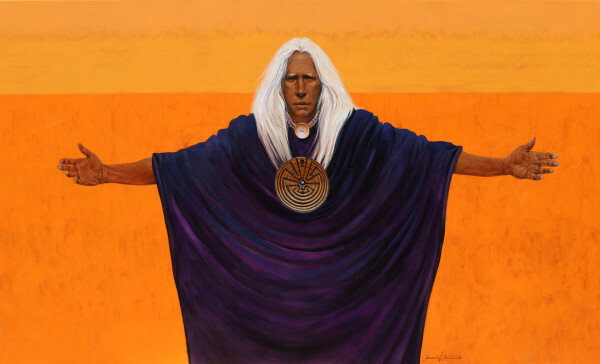 Lawrence’s work features the colors and themes of the American Southwest in all its mystery and magic. This smart, strategic approach to art has allowed Lawrence to make a living solely as an artist since 1979, selling millions of dollars worth of paintings in the process. An endless source of invaluable art career advice, Lawrence shares how he creates art that buyers want, whether it’s by thoroughly researching his customer base or evolving his style as his market shifts. Want to see more of Lawrence W. Lee’s work? Visit his Artwork Archive Public Profile Page. 1. 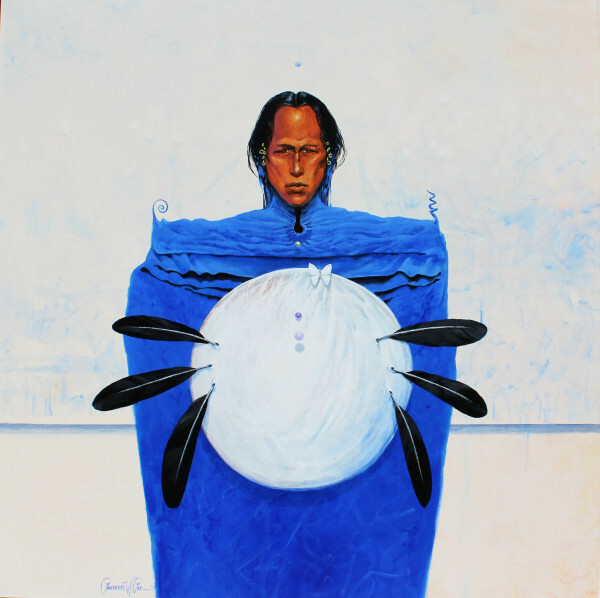 YOUR WORK FEATURES REPRESENTATIONS OF SHAMANS AND IMAGERY OF THE AMERICAN SOUTHWEST. WHERE DO YOU DRAW INSPIRATION FROM AND HOW HAVE THE PLACES YOU’VE LIVED INFLUENCED YOUR STYLE? I have lived most of my life in Tucson, Arizona. I moved here when I was 10 and went to college at Northern Arizona University. Up there I developed some familiarity with Navajo and Hopi culture. When I was a grad student, my roommate was a Hopi who had been born on Second Mesa and had a wife and child still living there. Occasionally he and I would get in his old pickup truck and drive along the flat plains of Northern Arizona heading towards the four corners area in the misty early morning hours in the most magical of places. His wife was kind enough to share stories from Hopi tradition with me, such as the story of spider woman who taught people to weave. I don’t know that it was directly a causative factor in what I do, but I have never forgotten the feeling that poured into me as we drove along those empty stretches of road with purple mesas in the distance as the first gold tint of sun began to invade our surroundings. The image is so powerful that it has stayed with me for decades. When I first started showing my art, I was painting imagery of people. I thought I was doing great stuff, but people at art shows would say, “Why would I want someone I don’t know hanging on my wall?” Argue as I might, I simply couldn’t sell a painting. I recall – through the haze of decades – that I was in my living room bemoaning this sad state of affairs and looking at the image of a profile of a woman I had gotten back from the gallery. I was in the Southwest, so I decided I should put some Southwest into the painting. I put a feather in her hair and took the painting back to the gallery. It sold in a week. The lesson in that occurrence was that apparently – once I added something that looked American Indian – the painting became desirable. I came to understand that people coming to Tucson, whether to visit or live, very much related it to American Indian culture. I had to make a decision now that I had discovered I could turn a painting nobody wanted into a piece of romanticized culture people could take home. I had to come to terms with being willing to go down that road or not, and I decided it was worth the journey. By adding feathers, beads, and bone necklaces, I could paint the imagery of people I wanted to paint, and that seemed a small price to pay. The accoutrements enhanced the figures I was doing and began to become an integral part of my thinking about these figures – not just a device to increase saleability. I have made a good living since 1979 and have sold millions of dollars worth of paintings. 2. MUCH OF YOUR WORK IS A BLUR BETWEEN REALISM AND ABSTRACTION. WHY DO YOU MIX ELEMENTS AND HOW DID YOU UNCOVER YOUR DISTINCTIVE STYLE? I went to college in the 1960s, and in the 1960s if you were working towards a Bachelor of Fine Arts you were expected to do abstract or nonobjective work. Figurative work was seen as antiquarian, it wasn’t modern enough. Everything that needs to be said about the human figure had already been said and wasn’t important anymore. I did life drawing like everyone else, but didn’t do any significant figurative work because I would have been laughed out of class and not received a degree. But right after graduation I got a commission from the head librarian at Northern Arizona University to do six paintings for the new library that was being constructed. I’d just recieved my BFA and didn’t have to worry about pleasing a professor, so I decided to do figurative imagery loosely based on Coleridge’s poem Kubla Khan. That was the beginning, and I think I’ve always had a fanciful nature. As the years have gone by, the figures have taken on lives of their own. They have developed structurally into anatomically impossible figures which I refer to as being almost human. I had the opportunity not long ago to take a look at a few things I did in college and shortly after graduation. I was stunned to see in them little circles and bubbles and swirls and curlicues and figures that were way too tall and had shoulders that were way too narrow or way too broad. I had no idea those ideas had been percolating in my artistic consciousness all those years ago. I didn’t know I had been singing the same song all this while, just adding new words and new verses. 3. WHAT IS UNIQUE ABOUT YOUR STUDIO SPACE OR CREATIVE PROCESS? It has often been said that the most important line in a drawing is the first line because everything else relates to it. I use a little stick of grapevine charcoal. Grapevine doesn’t fall apart into ash, but becomes a stick of charcoal when burned if too little oxygen is present for complete combustion. I’ve used other materials, but started using this in college. I use it to make the first line and all the way through to the finish of the drawing. If someone came in the night and stole my grapevine charcoal I would not be able to do another painting. This is the tool that I know best. When you’ve used something for decades, it becomes an extension of yourself. When anything changes, such as when the canvas makers change cotton suppliers or when they stretch the canvas differently or use a new primer, it takes me weeks to adapt – and sometimes I can’t. Sometimes I have to sand it down or add more gesso layers. For years I used the same make, number, and style of brush to sign my name on my paintings. It was an extension of my hand. When I started to paint again after retirement, I couldn’t find those brushes anymore. I’ve been painting now again for two years and I still struggle to sign my name because the brush isn’t the same. It makes my crazy. I also scumble – using a dry brush which leaves some e color in the valleys of the weave. It’s really scrubbing, and as you scrub with a brush, you lose the point. It wears out. The brushes I like the best are perfectly worn for me. If I had to start with pointy springy brushes, I wouldn’t be able to do what I do. 4. YOU CATER TO BOTH RESIDENTIAL AND PUBLIC ART BUYERS. HOW HAS THIS INFLUENCED YOUR CAREER AND HOW DID YOU BREAK INTO THE PUBLIC ART SPHERE? That division of public and private on my website is a construct that I decided to use a few months ago, even though my work has been purchased by corporations and businesses for years. IBM bought six of my pieces in the mid to late 1970s. Many corporations and public spaces have purchased them. The buyers have had to be really gutsy because my paintings are intense and confrontational. I learned in college that you’re not supposed to center the composition or use black. But I had to ignore those rules so that I could do what was in my head – these confrontational beings. In the 1970s, as my career began to take off, my main clientele was made up of willful, very wealthy, and very self-assured real estate developers in the Southwest. They would often buy my paintings and put the most powerful one behind their desk to increase their power and intimidate whoever was in front of the desk. In the early 1980s, there was a savings and loan crisis kind of like the banking crises we just had. People were playing fast and loose with the rules. Suddenly these multi-millionaire developers were penniless and on the lam from the Department of Justice. Suddenly my sales almost disappeared. But I knew the money hadn’t disappeared: someone else had it. And I decided that it must now be in the hands of the real estate developers’ attorneys. So, I thought about what attorneys want in their offices. They’re going to want something that looks toward a bright future and a big settlement. I did my best to accommodate my imagined desire on the part of the attorneys and turned my figures around. I painted them from the back. I could do that because all kinds of Native American ceremonies incorporate wonderful costumes. They were obviously looking forward to something, and that had to be a brighter future. As soon as I did that, my paintings started to sell again. After a few years and after enough people had asked, I turned my figures back around. 5. 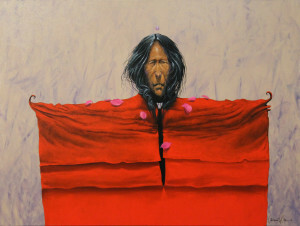 WHY HAVE YOU BEGUN TO PAINT LANDSCAPES AND STILL LIFES AFTER ALMOST EXCLUSIVELY PAINTING SHAMANS? My paintings are very intense and almost all have confrontational eye contact. In many cases, people don’t believe they are appropriate for public spaces, so for the first time in 40 years I’m doing landscapes again. I’ve discovered parts of me that I’ve had to tamp down as I pursued a career. 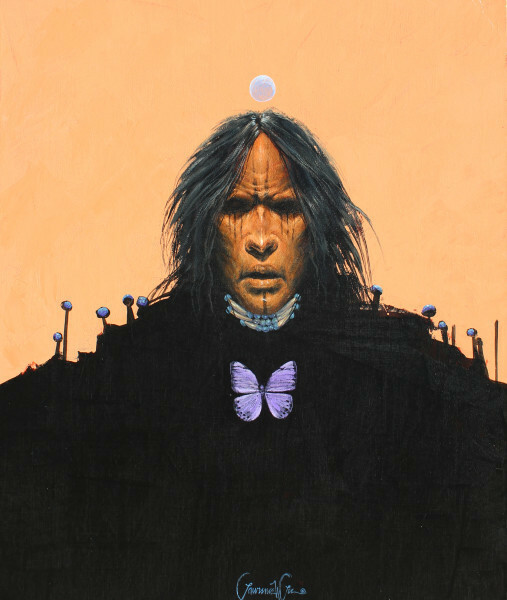 I have to convince people that it’s alright to like a Lawrence Lee that isn’t an intense quasi-American Indian shamanistic figure. Since 1985 I have been an artist member of a private club called the Mountain Oyster Club. It was started in 1948 by a group of wealthy young polo players who decided they ought to have a place for themselves. 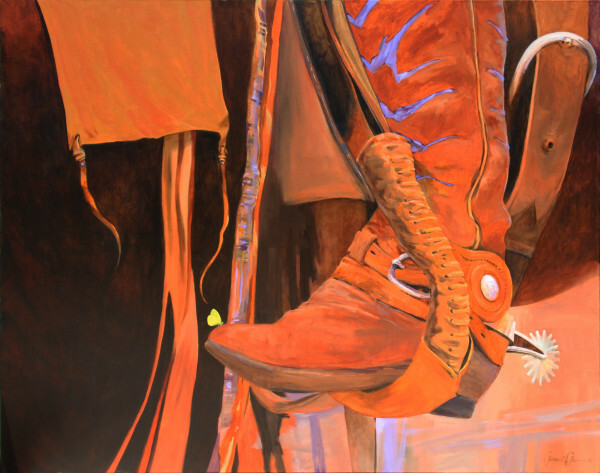 They had a love of Southwestern art, especially cowboy art. 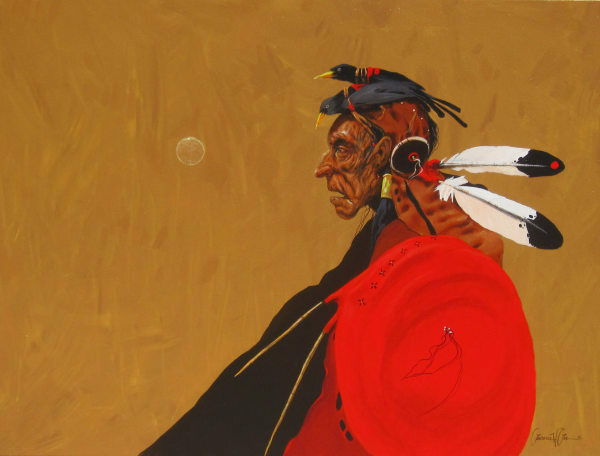 They started to have an annual art show to raise money and it became so successful that it attracted the very best Southwestern and cowboy artists. If you didn’t have work in the M.O. show, you were nobody. In the 1980s, most of the founding members had departed or passed away, and one guy decided who was accepted into the show. You had to get on this one guy’s radar, so he might call you and come to your studio. At that point he would make a final determination. They have an annual show that is still very good, but it’s mostly cowboy work. But my work has always been a little too large and little too strange. I never knew why he decided to let me in. So this year I decided to do some special pieces for the people who go to the M.O. show every year. That got me to thinking about boots and spurs. I got to apply my artistic sensibilities to that specific subject matter. In all those pieces I take a subset of larger shapes. I may be focusing on the bottom part of a boot or stirrup or part of a saddle with a spur because that’s the way I think. I usually try to include in my work a bit of cognitive dissonance like a bubble or a butterfly and I never know what’s going to show up next. 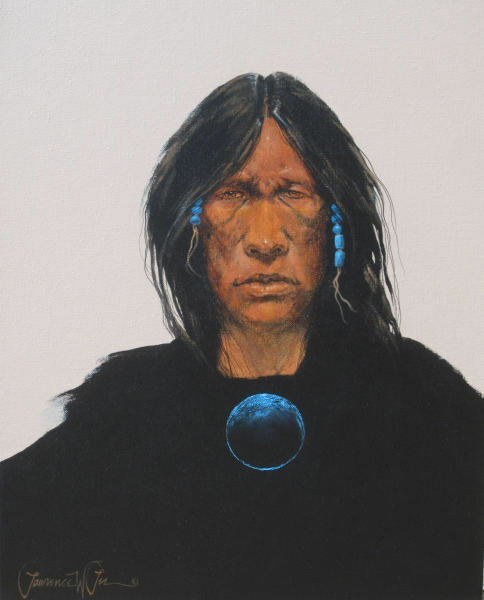 The move into that area was a business calculation and was born out of a belief that in the late stage of my career I can paint good paintings that aren’t shamans. 6. YOUR ART IS COLLECTED ALL OVER THE WORLD IN PLACES LIKE JAPAN, CHINA, AND ACROSS EUROPE. WHAT STEPS DID YOU TAKE TO SELL ART OUTSIDE OF THE US AND GAIN INTERNATIONAL RECOGNITION? By and large I have not had to take one step outside of Tucson to do that because this is a world traveler destination in and of itself. Arizona has Monument Valley and the Grand Canyon and the Old Pueblo. People come here from all over the world and want to take home some of the magic found here, so my art is a perfect match. I find out from galleries or friends of friends that a foreign collector has one of my pieces. Someone will say: “By the way, this gallery is shipping one of your pieces to a man in Shanghai.” That’s largely how it has happened. I did have a one-man show in Paris, but even that happened because a clothing designer from Paris who was vacationing in Tucson contacted me because she wanted to show my work there. 7. YOU HAVE BEEN IN AN IMPRESSIVE NUMBER OF MAJOR EXHIBITIONS. HOW DO YOU PREPARE FOR THESE EVENTS AND WHAT ADVICE DO YOU HAVE FOR OTHER ARTISTS? One thing that a lot of artists don’t understand is that people usually want to purchase art that is going to live in their homes with them. In areas outside of NYC, LA, and Brussels and the like, if you do a work of high concept art that is a statement about the devolution of man as represented by rubberized foam worms suspended from a ceiling over kiddy pools filled with artificially sweetened coffee, you’re probably not going to find someone to buy it for their home. You have to understand that if you want to make a living doing that kind of thing, you have to move to a city that accepts that sort of art. My advice is to look your art as though you are a potential buyer. You can figure out a lot if you do that. Many years ago, I showed in San Francisco and couldn’t sell a thing. I was depressed until I thought about it and did some careful research. I discovered that most of the homes owned by people that could buy my work had walls that were way too small for it. If I was living in San Francisco I would have known that almost instinctively. If I’m living in a three story old Victorian house down near Union Square, what kind of things would I want on my walls? In Tucson, most people want things on their walls that have a Southwestern flavor unless they were born and raised in Boston and want to bring their sailing ships. It’s important to know the places your potential buyers live in. If you’re a potential buyer, what would you want to know about the artist? If you have questions about the artist, your potential buyers are going to have the same questions about you. In other words, do your best to figure out what your potential buyers want and try to give it to them. Want to Organize and Grow Your Art Business and Receive More Art Career Tips? Sign Up for Free Here. This self-taught artist discovered her distinctive technique as a muralist. Learn how Dage prepares for shows and stays focused on the present. When René Romero Schuler first entered the gallery scene, she was told her work was “too dark.” Now she is making waves with her distinct style. At the age of 37, Randy L Purcell decided to pursue his passion and return to school for a BFA. Now, he's prepping for a solo show at the Nashville International Airport. 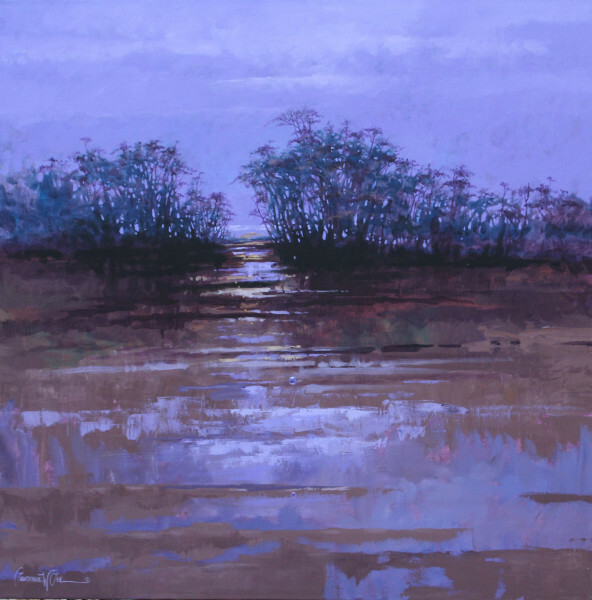 Learn about his inventive painting technique and unique path to success. 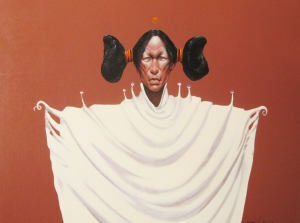 Lawrence W. Lee has sold $20,000+ worth of art via his Public Page on Artwork Archive and you can too. Find out how he does it.